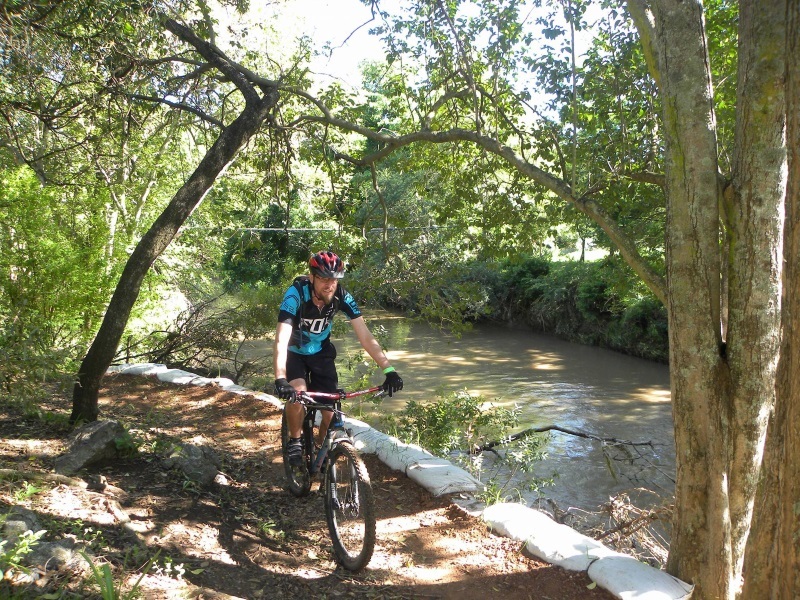 Hennops MTB Trail’s unique features are the Hennops river flowing through a valley bordered by mountain ranges to the north and the south. 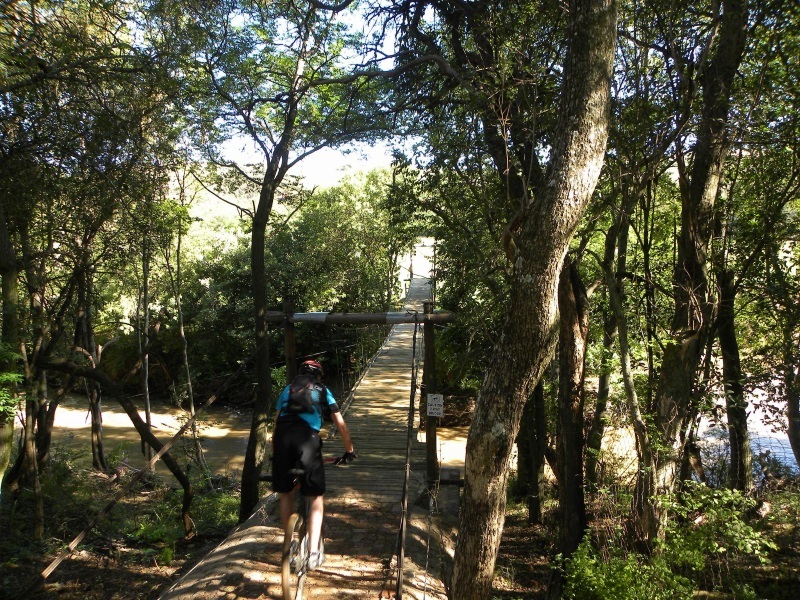 This gives our 90% single track purpose built mountain bike trail a variety of terrain, some steep climbs and descents, lots of natural obstacles and great views to enjoy. The trail is 33km in total (Elevation gain 490m) and is made up of 7 sections with shortcut options after each sections to make up your own distance from 5km to 33km. You also have a short cut option after each section to make up your own distance. Beginner riders: Take the “Short Cut” at Safari and Snake and try the Kyalami section, complete with the Home Run back home. This will be 14km’s. Or take all “Short Cut” options to ride only 10km. The first section ‘River’ is suitable for beginner riders. Surrounded by the river and trees this beautiful flat section offers a 30m suspension bridge, berms, swirls and turns, a few ups and downs and fast flowing flat bits. The River section forms the beginning and end of the Green trail. The name says it all! If you like mountain climbing – this is the one! This is a twisting mountain single track with many switchbacks. Come test your technical skills here, but be careful as the name suggests the Snake can bite! 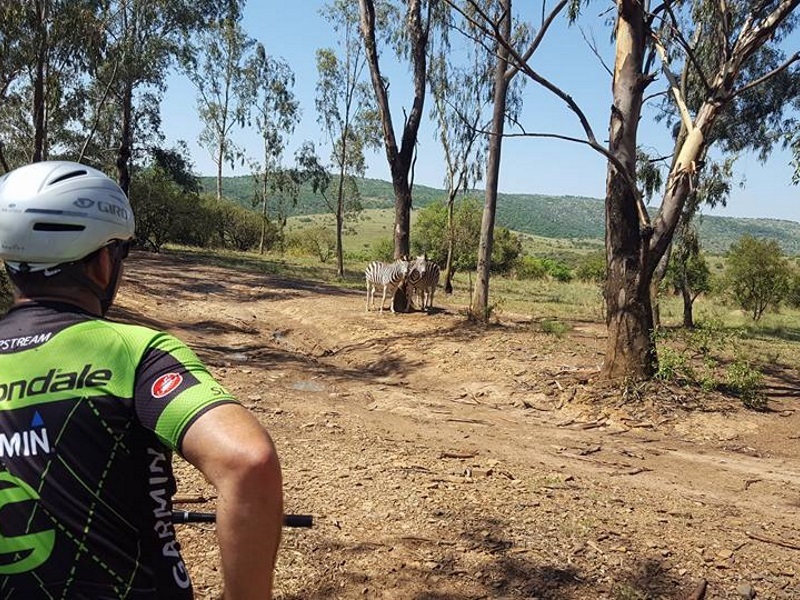 Kyalami is a flat, super smooth flowing single track with long and short corners to test your flat terrain riding. Home Run takes you back tot the home leg of River and back to Hadeda camp. This is a fast downhill track. Skeleton offers a variety of terrain from flat Savannah to gorges and creek bed riding. We would love to take your call, but due to high call volumes we aim to answer all your questions in the section below. Do you offer card payment facilities? No, unfortunately not. We have braai facilities available. Do you offer braai facilities? During the week (Mon – Fri) you can start at 07h00. Please call 082 825 9205 to book for the trail on normal weekdays(Non-Public Holiday). We will be closed on 25 December. © 2018 Hennops Hiking Trail. All Rights Reserved.